In early 1975, despite Elvis' clearly fading desire to record new material (he hadn't recorded a new studio album since 1973), Elvis managed to step up to the challenge one more time. Little did anyone within the Elvis Presley circle know that when Elvis stepped into the RCA recording studios in Hollywood, CA. on March 10, 1975, it would be the last time “The King of Rock N' Roll” would record music in a proper studio setting. However, the results of this 3-day recording session produced arguably the most diverse album of Elvis' career – Elvis Today. 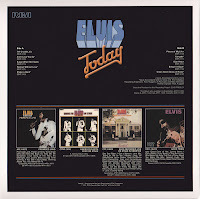 Elvis Today, released in 2005 by the Follow That Dream (FTD) Collector's Label provides fans with 2-CD's packed with all of the known material recorded between March 10-12, 1975 for the Today album. Disc one kicks off with the 10-songs included on the Today album, as it was originally released in 1975. As mentioned, the original 1975 album provides fans with a diverse listening experience into the effortless way Elvis could switch from a beautiful ballad to a classic cover to a rock n' roll original! Following the original 1975 album on disc one, fans are treated to some outtakes from the recording sessions including the previously released (but still fun to listen to) “Tiger Man” jam, which gives the band a chance to let loose in between songs. Clearly the band and Elvis are having fun, which is a nice treat to hear considering the aforementioned hesitation Elvis had to returning to the recording studio once again. Listening to Elvis work out the lyrics and timing of “Pieces Of My Life” (takes 2 & 3) is a real fly on the wall experience on disc one, along with Elvis announcing “you don't believe that s**t, do you?” prior to take 3 of “Susan When She Tried.” Beautiful outtakes of “And I Love You So” (takes 2 & 3) also highlight the outtakes of disc one. 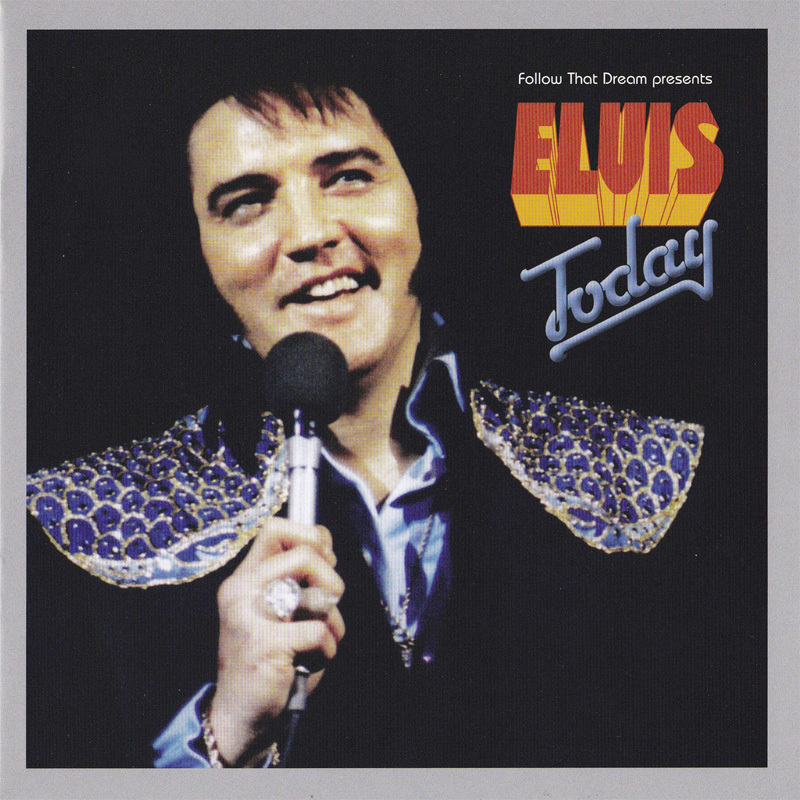 Disc two of the Elvis Today FTD release starts with the 10 original songs from the album, but this time, we are able to hear the songs as they were originally recorded...without the post-recording session overdubbing that producer Felton Jarvis is so famous (infamous?) for. This section of the 2-disc set may very well be the true high point of this package! Fans get to hear the songs the way Elvis truly recorded them. Songs like “I Can Help,” “Woman Without Love” and “T-R-O-U-B-L-E” almost sound like different versions without the overdubs and it is a real treat to hear these “original session mixes”. Rounding out disc two are more outtakes from the Today sessions, which were originally released on the 6363 Sunset FTD release in 2001. Although previously heard by fans, it is nice to finally have all of the Today session material gathered all in one place. One could argue that the material on the Elvis Today album may not be his strongest, and of course that is left up to the judgement of each individual listener. Personally, while “Woman Without Love” and “Bringing It Back” are for me the two weakest songs on the album, I use the term “weakest” lightly. Certainly, Elvis' deliverance of the songs and the passion in his voice lift the material up from what may otherwise be considered as album filler. Other songs like Elvis' covers of the Statler Brothers “Susan When She Tried” and Tom Jones hauntingly beautiful “Green Green Grass Of Home” are proof that when given the right material, Elvis can make any song his own. Then we come to the two highlights of Elvis Today in the opinion of this reviewer. The original rocker “T-R-O-U-B-L-E” provides clear-cut proof that, even in the last couple years of Elvis' life, he could still rock n' roll with the best of the best! Simply a fantastic song and a true Elvis rock classic! On the opposite side of the spectrum comes the simply stunning “Pieces Of My Life.” Some fans argue that “Pieces Of My Life” may very well be a musically autobiography of sorts for Elvis, but regardless, Elvis delivers an outstanding performance. 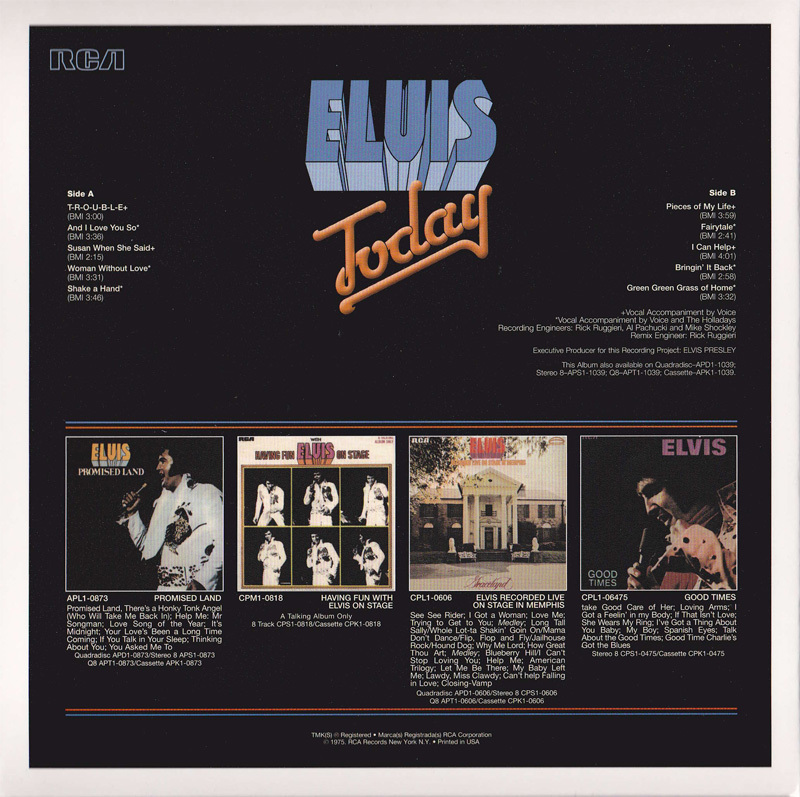 The packaging of Elvis Today is fairly basic, with an up close concert photo of Elvis and the original back album cover art featured on the inside of the customary tri-fold cover and a plain black back cover with the album tracklisting. One complaint I have is the poor quality of the front cover photo. The picture of Elvis is very dark, almost as if the photo used is a copy of a copy. Also, if you look closely at the Today title, you can see where it appears that the artwork was cut out from another source and pasted onto the cover...very sloppy in my opinion. The 12-page booklet included with the Today FTD is nicely assembled and fun to flip through while listening to the album. Inside the booklet, fans are treated to some photos of RCA documents and memos associated with the making of the album, along with some period concert photos and the usual In And Outtakes and Behind The Scenes sections which provide the listener with more details surrounding the recording of the material and the original release of the album. In the history of music, has there been any other artist that could make singing a blues song, a country song and a rock n' roll song sound so easy? Perhaps yes, perhaps no...but listeners of the Elvis Today album are able to take that journey with Elvis. 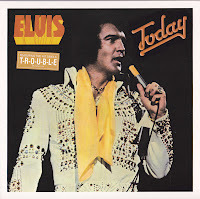 All in all, the double CD release of Elvis Today by the good folks at the Follow That Dream Collector's Label is a welcomed addition to the Elvis catalog and until recently, was my all-time favorite Elvis album...but that is a whole other story. I would like to take a moment to thank Thomas for allowing me the opportunity to be a guest contributor for the Elvis Today Blog. As a fan of Elvis' music and of Thomas' blog, I am deeply honored to have been asked to do this. Many thanks Thomas and to the readers for taking the time to visit this fantastic site!! Mike, thank you for a great review of the Elvis Today album! This has always been a favorite of mine too, ever since my brother picked it up together with Elvis Now many, many years ago. I remember listening to "T-R-O-U-B-L-E" for the first time, it just blew us away! In a way it's funny that I've never written about Elvis Today. After all, I used the title of the album for the name of my blog when I started it in 2007. I'm glad you stepped in to fill that void, Mike! So, once again, thanks for a fantastic post! It was my pleasure Thomas!! I am so glad you like my review, and I hope your readers enjoy it as well!! Again, MANY THANKS for the opportunity to guest blog for your site! I am deeply honored!! 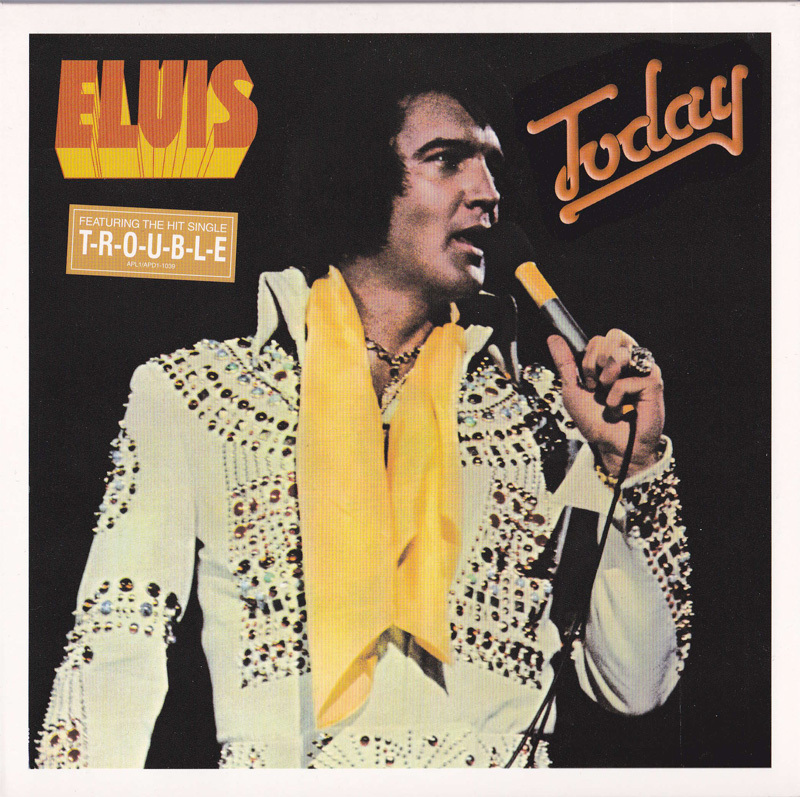 "The music contained in the Elvis Today FTD release was mastered by Lene Reidel and HE does a fine job with the material"
Lene Reidel is a she... I mean, she's a woman. That was a typo...thank you so much Jimmy for catching that and to Thomas for fixing it. My apologies to Ms. Reidel! !